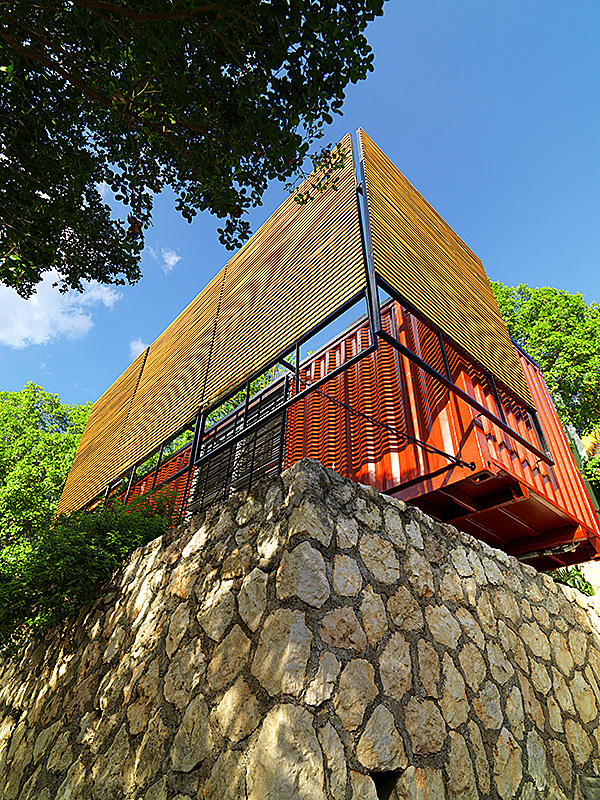 The Jamaican Institute of Architects granted the Award of Merit 2008 ‘Best Small Commercial’ to the Cornerstone Design Office for their submission of a Shipping Container Office. 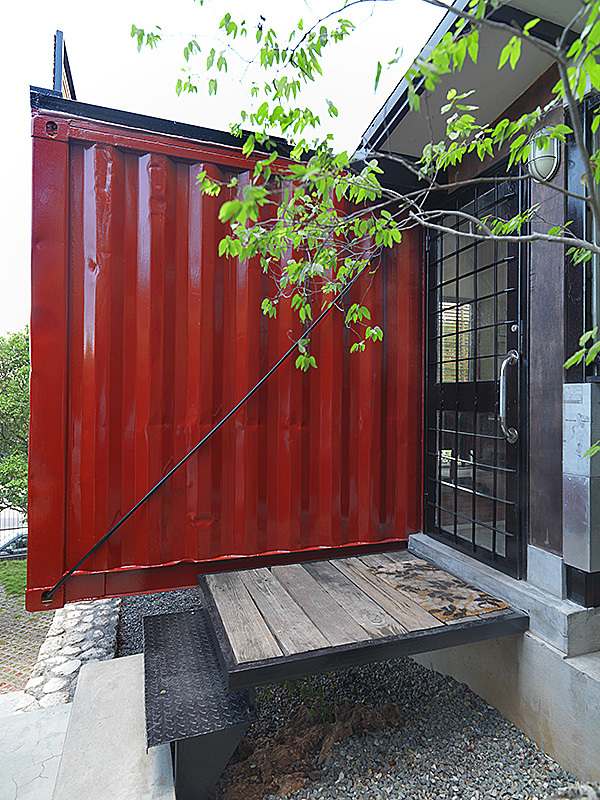 This is how Cornerstone Design describes their shippint container office: “The basic premises governing the Container Office scheme are those of adaptive reuse, layering and modularity. 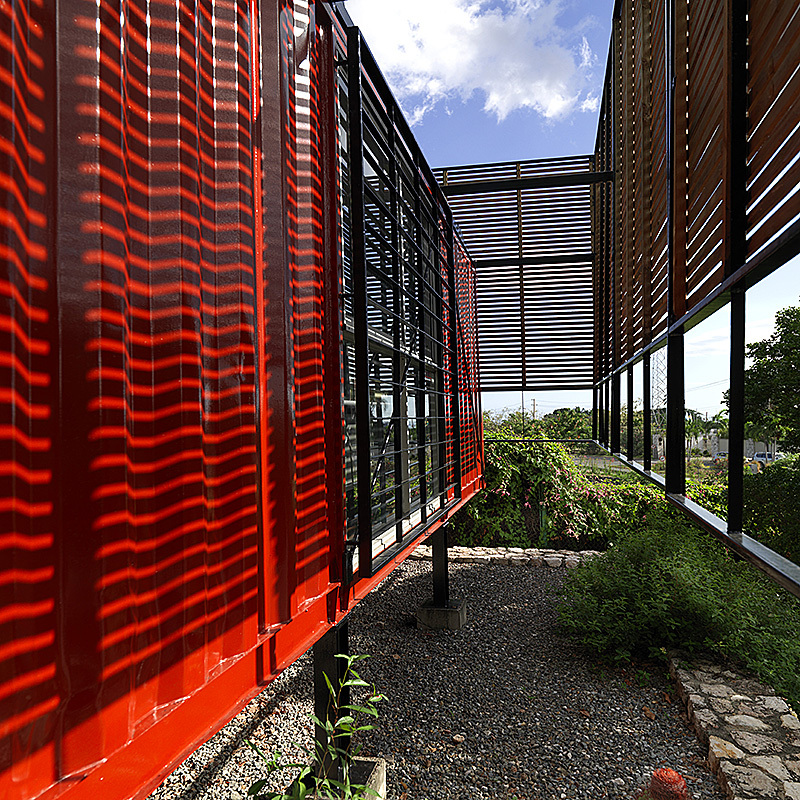 The shipping container presents itself as a whole module at one scale, transportable, interchangeable and re-usable, but also as a group of modules at another scale. 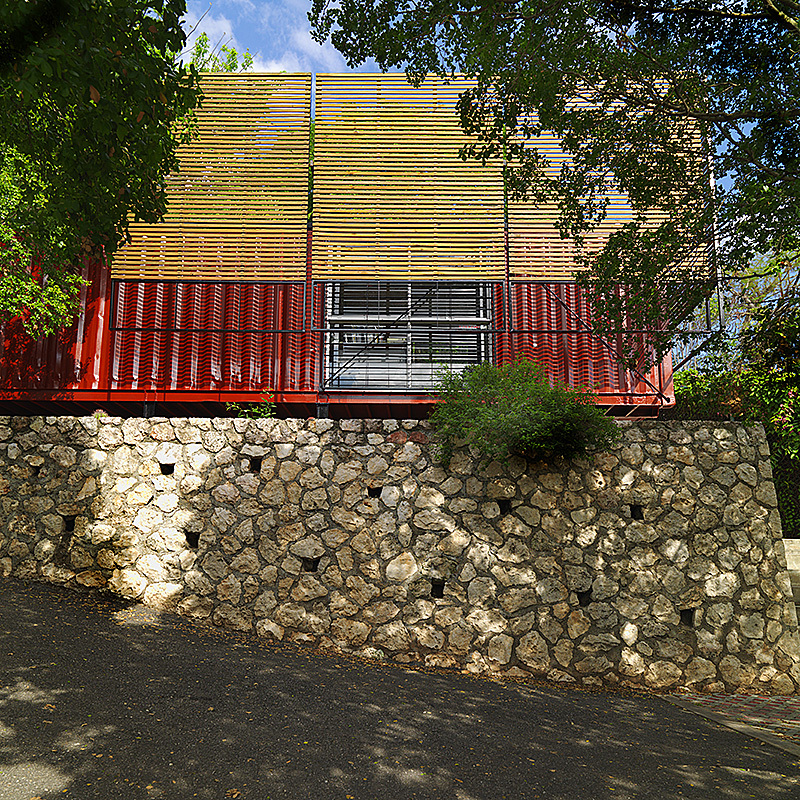 The proportion of the whole can be easily divided in five equal cubes or sub-modules, and it is these that define the structural organization, the organization of the space within, as well as the exterior elements such as the sunshade screens for climatic control and the aluminium exterior cladding panels. The simple open interior is organized into four zones: circulation; work; service; and meeting. The linear circulation zone of the extension to the box mirrors the work zone, while connecting to the other two as well as to both entries. 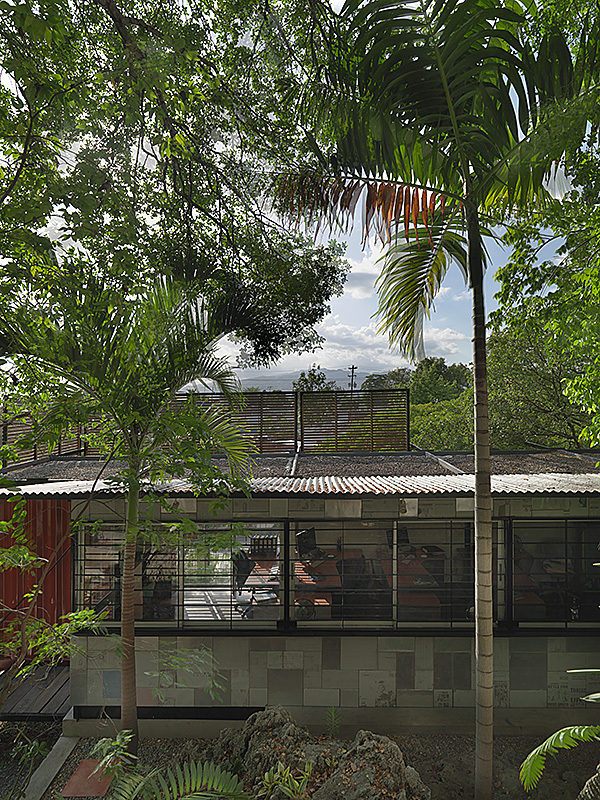 The proportions of the sub-module also organize the high degree of openness to the exterior. A limited but distinct array of materials including timber, polished concrete, and brushed aluminium, are used to highlight and reinforce the organization of the zones, as is the use of lighting elements and colour. The whole scheme can be read as a series of layers defining public (street), semi-public (elevated office) and private (hidden garden) spaces. 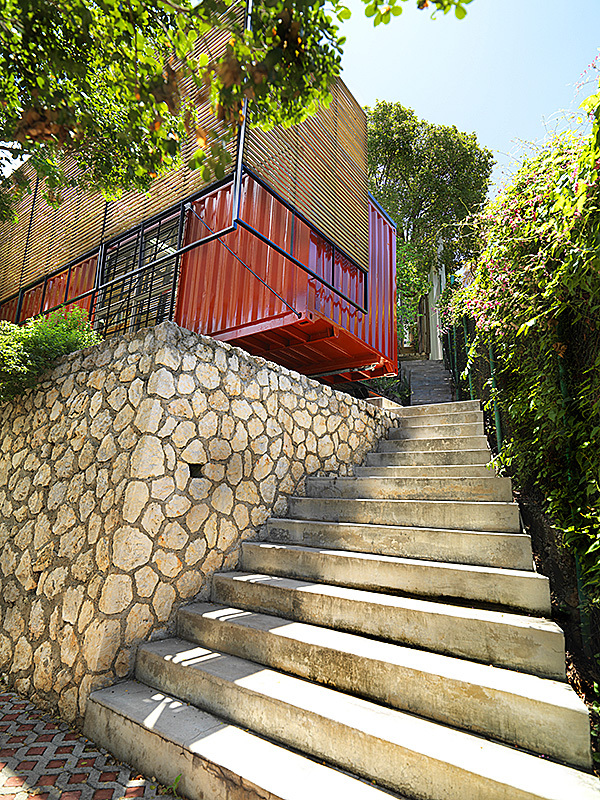 The programming of materials, and the terracing of the naturally sloping site again achieve this. 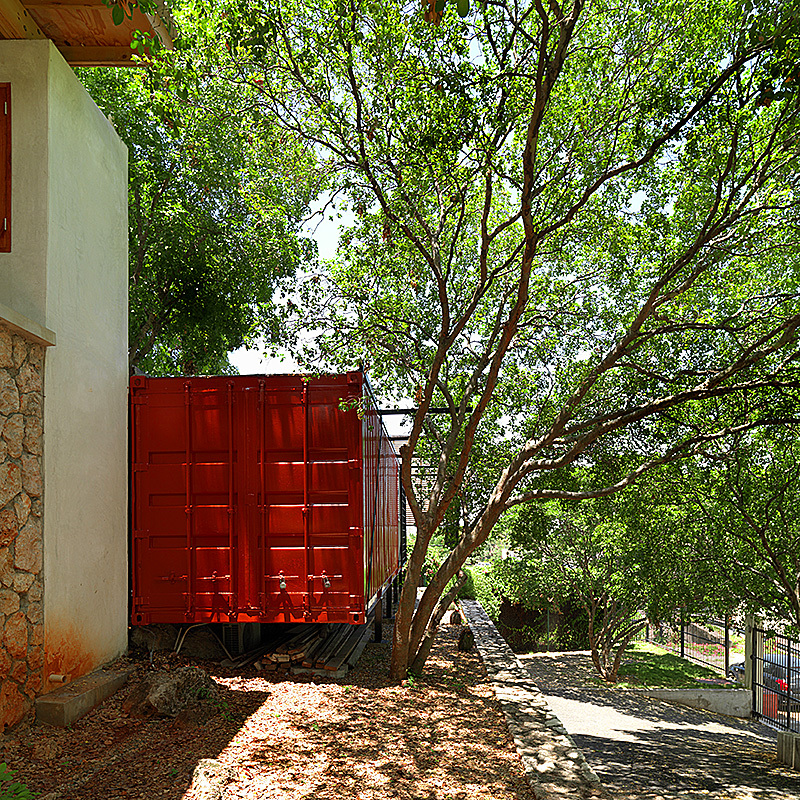 The stone and unaltered COR-TEN steel of the container act as stereotomic barriers to movement, sound and light from the front, screening the private garden behind. 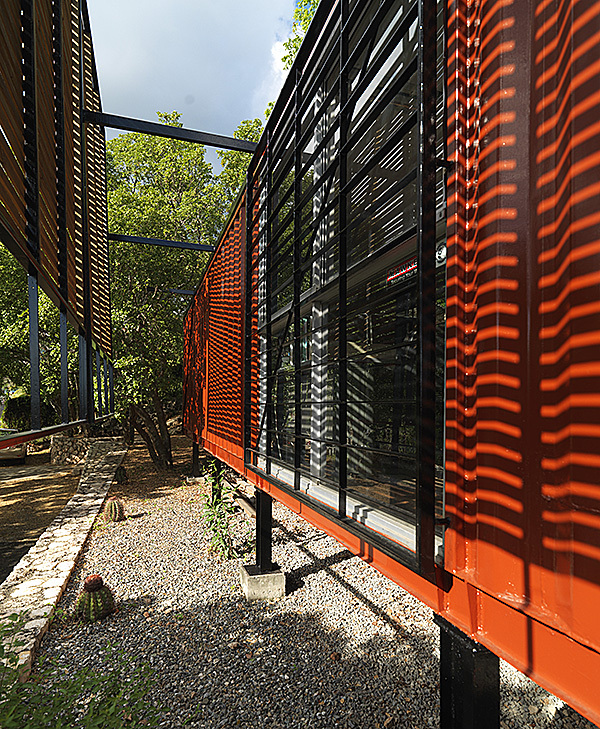 The techtonic constructs of the movable shading devices and the extension to the box act as links or thresholds between the three main layers. 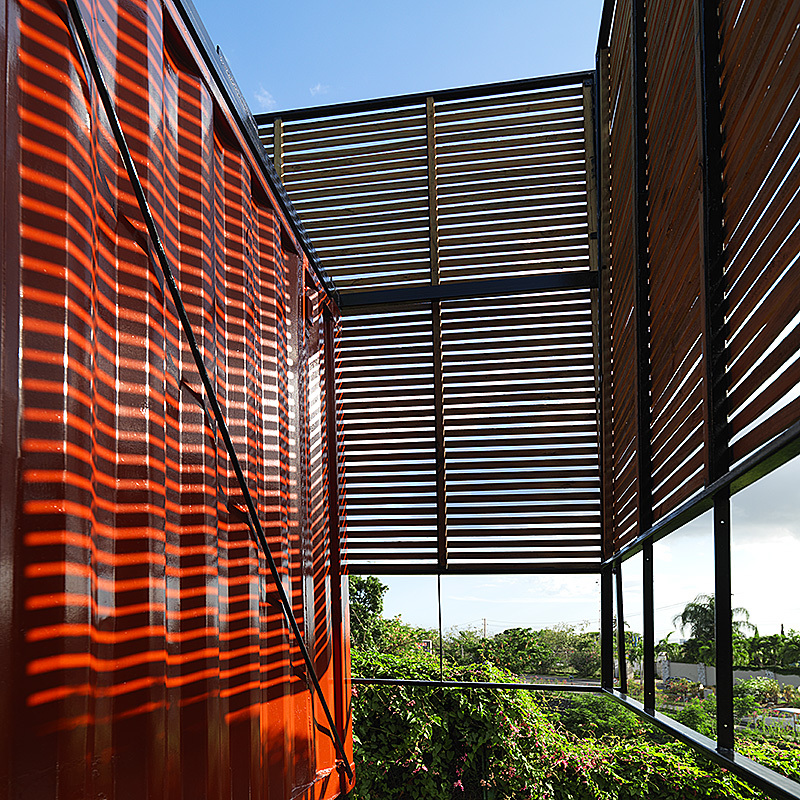 The entire sequence is repeated immediately behind within the private residence that adjoins and overlooks the office, creating a coherent organization throughout the site”. 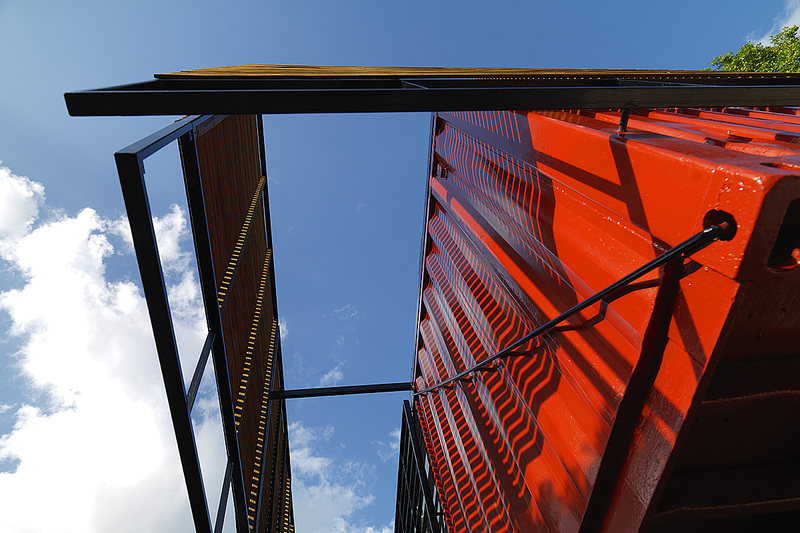 The notion of an office in a shipping container is intriguing in its own right, but the way it has been handled is worthy of a few additional observations. I must tell you that the hair at the back of my neck stood up when I heard Chris Whyme-Stone describe how the container was lifted by a crane from the street and swung, precariously, between the trees to sit on support at the top of the rubble stone retaining wall as if it was always there. 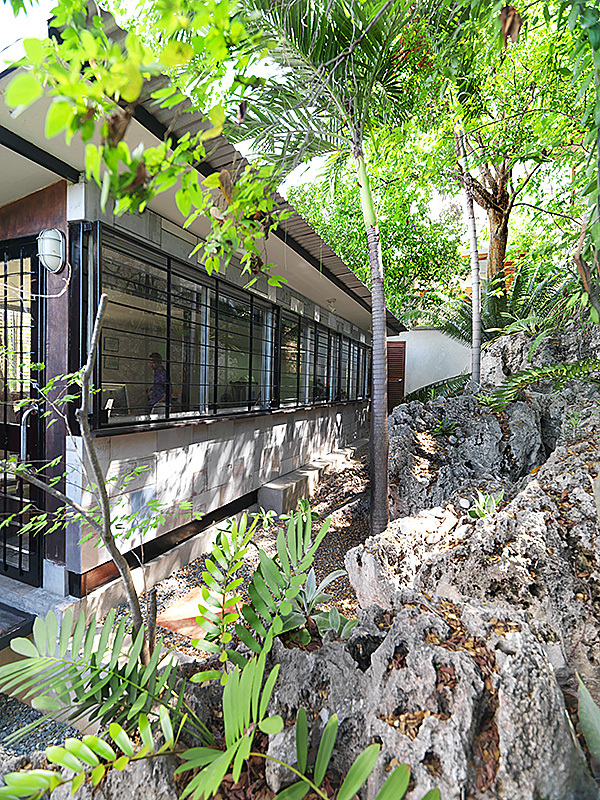 The office overlooks the private landscaped hillside shaded from the sun. 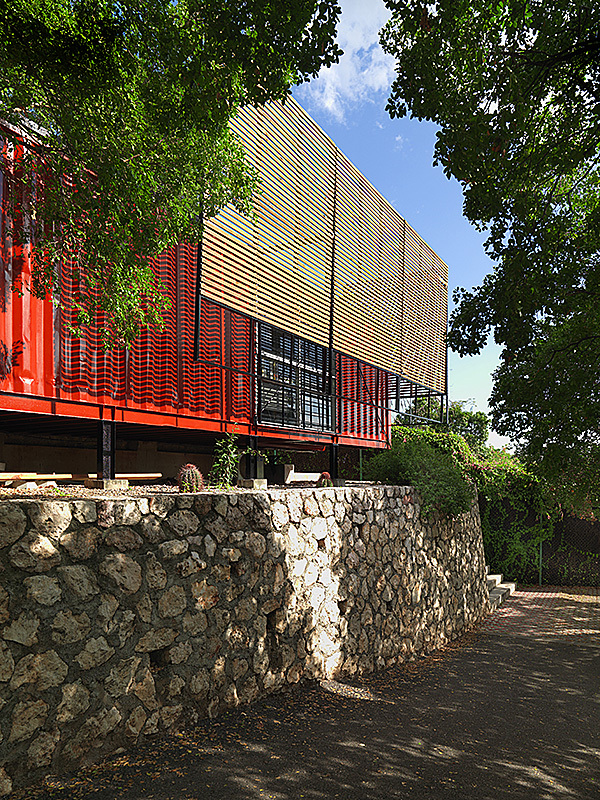 The hillside façade of the container is made up of a horizontal band of glass louvers, below that is a solid band finished with newspaper printing aluminum screens that add a nostalgic dimension. The office interior does not quite rise to the level of innovation one would expect but I daresay in time changes can be implemented. 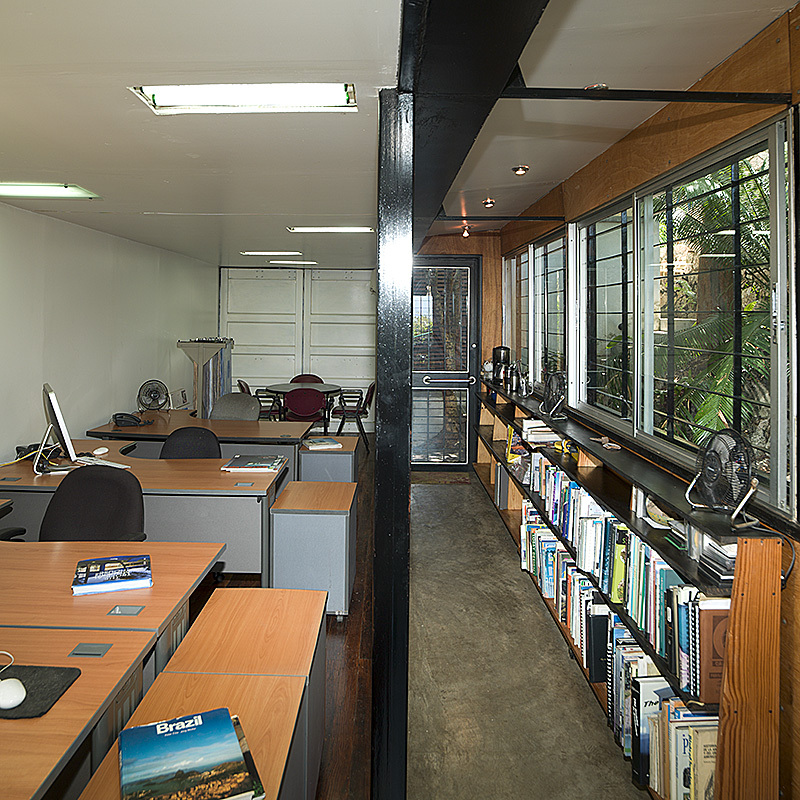 Cornerstone Design should be applauded for implementing their innovative design philosophy in their office. This was the first project to be photographed during our two-week assignment in Jamaica. I knew I had made a mistake renting a car when we got totally lost driving from the airport to the hotel. The very next day was the photography of Cornerstone office project [a mere 15 minutes away from the hotel], my assistant and I set off with map in hand and equipment in the boot. An hour and a half later we ended up downtown, way off course and had to call the office to get directions. It did not end there as we discovered there seems to be a shortage of road signs and up-to-date road maps in Kingston. Hours later we arrived with little morning sun left so we had to move very quickly. The Cornerstone Office site is heavily planted with lignum vitae trees so dealing with the sun was definitely the priority. Since it was a weekend it was not a problem to shoot the interior once we moved around some paper and computer wires. The container is of course very photogenic in itself. 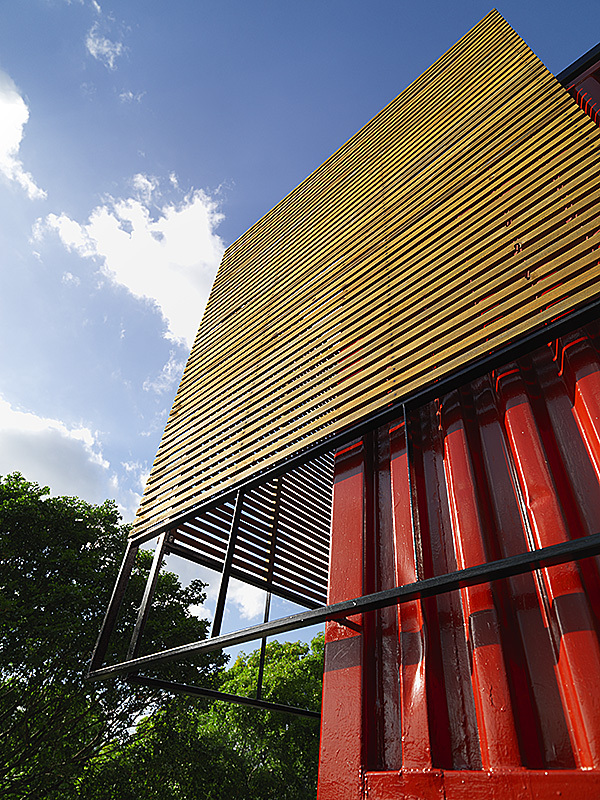 Seen less as a building and more as sculpture, the container lends itself more to interpretative expression rather than a record of classical proportions and form. 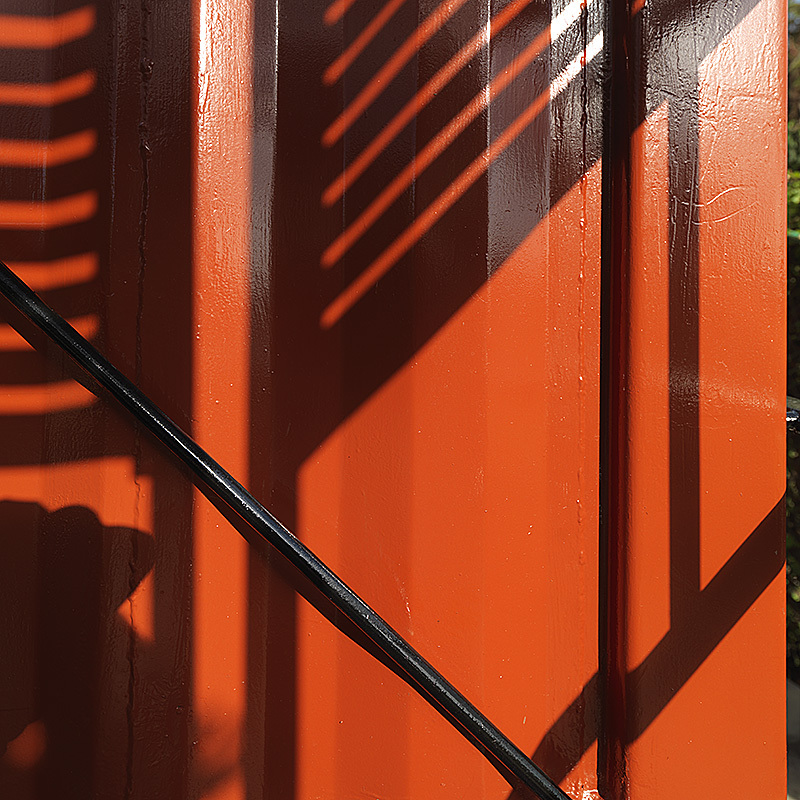 I was particular moved by the strong shadows created by the slatted timber screens on the crenelated surface of the red metal walls of the container.